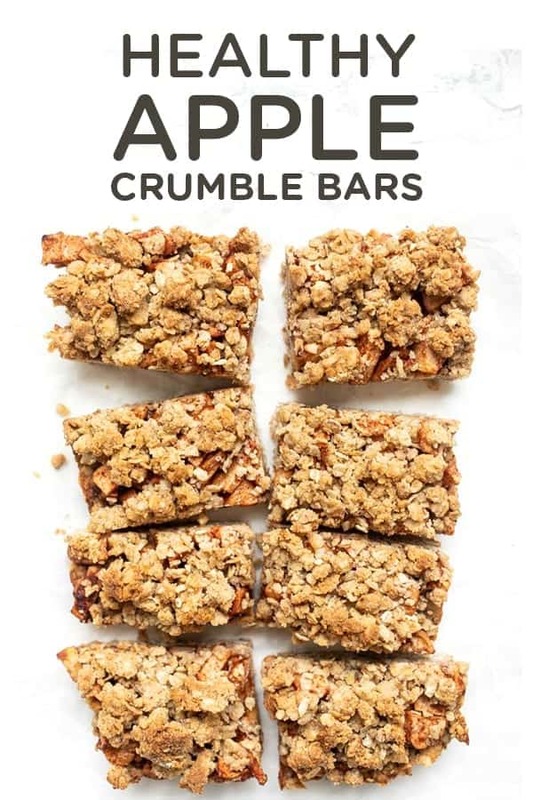 These Healthy Apple Crumble Bars are made with just 10 simple ingredients and use only one bowl! They're naturally sweetened, gluten-free and vegan too! What do you get when you combine apple pie and granola bars? An amazing breakfast/dessert that tastes like a decadent sweet treat but is actually healthy. Yep, you heard it here first. 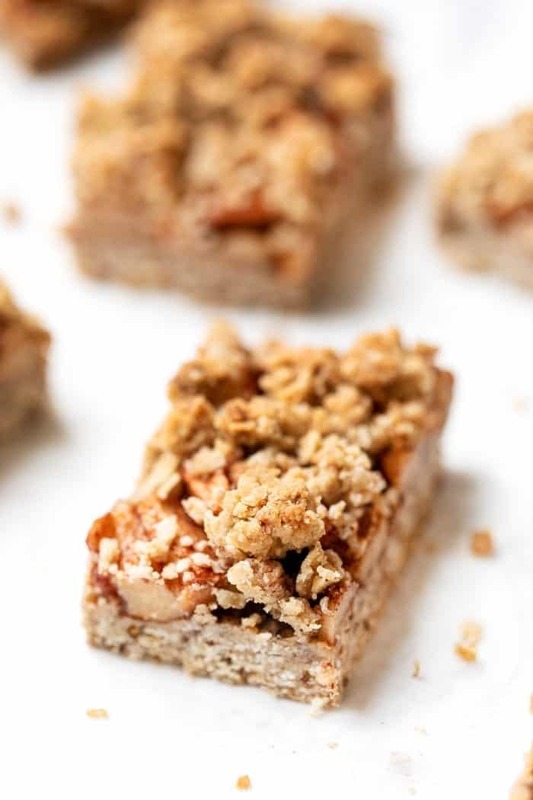 These apple crumble bars are not only tasty but actually good for you! Why? Because they're made with whole grains, nuts, natural sweeteners, and real fruit. Nothing artificial here, just pure, clean deliciousness. You might recognize this base from my healthy raspberry oatmeal bars, but it really does make the perfect crumble. 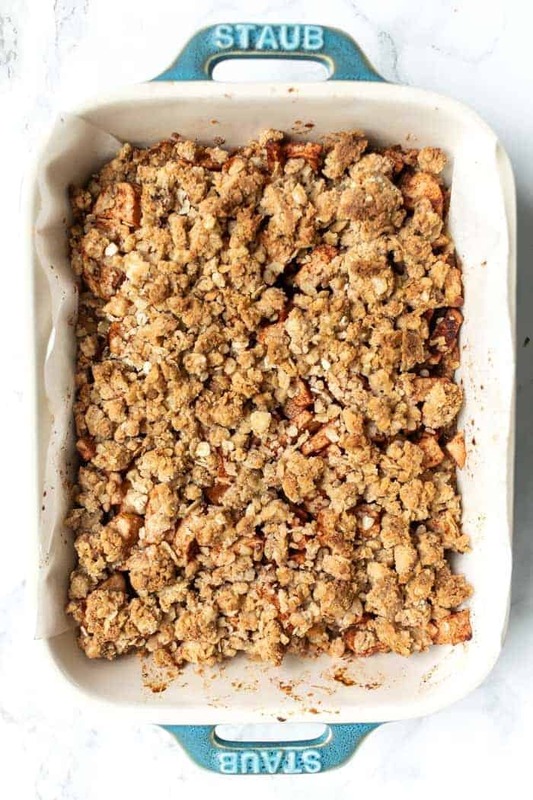 Unlike traditional crumble toppings, you don't need butter and you need very little sugar for this version. Yet you're left with those glorious crunchy clusters that can easily put other crumbles to shame. The best part of all? 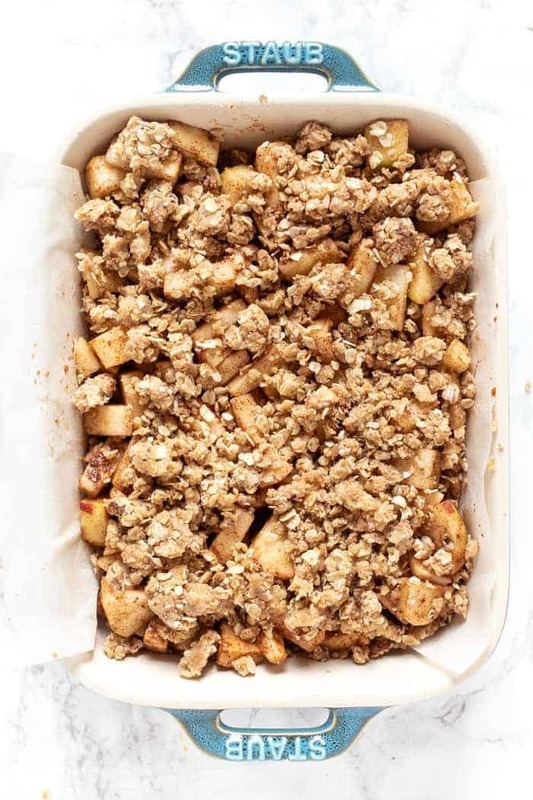 Our crumble topping is also our base! So you just need one bowl to make this entire recipe (which I personally think is a major win when it comes to baking) and 10 ingredients! Once we've got our base/topping done, we can move onto the apples! Similar to an apple pie or crisp, you want to quickly toss your apples with some cinnamon, a sweetener (in this case maple syrup), and a touch of starch. The starch is optional, but it helps make everything a little more gooey and soft. To make this dessert gluten-free and vegan, we're using a blend of quick cooking oats (make sure they're GF! ), almond flour and quinoa flour, then tossing in a flax egg instead of a chicken egg. 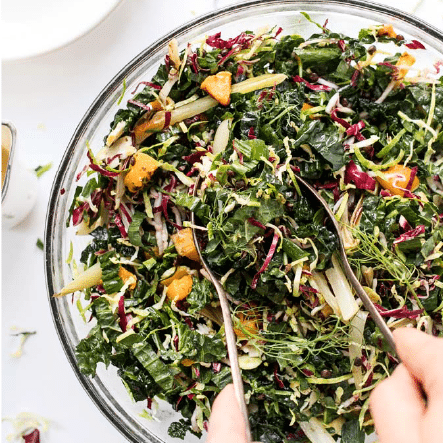 I personally love the combo of these ingredients and you'll see them in a lot of my baked goods because all three not only add great texture, but we also get amazing nutrients. I'd say definitely better than most other dessert recipes you see! 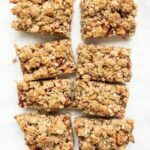 Next time, rather than slaving away at an apple pie, whip up a batch of these healthy apple crumble bars. They'll satisfy that sweet, apple craving, but they're far easier to make, take way less time and are healthier! They're a triple whammy 😉and they're pretty much the best fall dessert/breakfast on the planet. You def need them in your life! 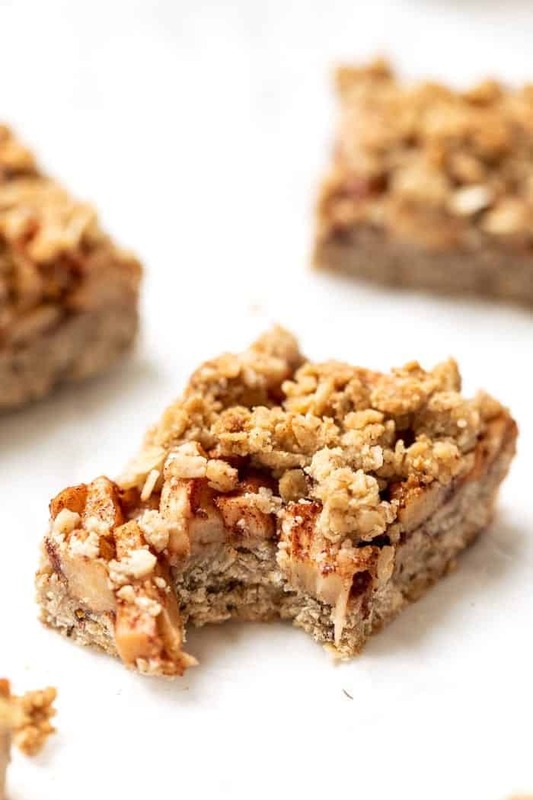 These are the perfect Healthy Apple Crumble Bars! They're made with just 10 simple ingredients and are also gluten-free & naturally sweetened! Toss all the apple ingredients together until combined and pour on top of the base. Spread out evenly with a spatula. Crumble the reserved oat topping over the jam. Bake in the center of the oven for 40 - 45 minutes until the oats are golden brown. Check after 30 and cover with foil if the topping is getting too brown. Remove and cool for 30 minutes, then transfer to the fridge and cool completely. Slice into squares and serve! Hi, I really like you’re posts. Recently i found sunflowerseed flour in my supermarket. Could you make a sweet recipe with it or do you know anything about the usage of this flour? Made these today to have for breakfast this week. Yum! Love the apple filling with the crumbly top. Can’t wait to have another one with my coffe in the morning. I need to try this! Is there a way I could leave out the coconut oil? You could try a nut butter maybe? I haven’t done it without oil, so I’m not 100% sure! I don’t have quinoa flour, but lots of quinoa flakes, may i use them instead? May I grind the flakes and use when your recipe calls for quinoa flour? This might be a stupid question, but I will go ahead and ask anyway,because I have been wondering about this for so long, and never tried it. Thank you so much for working so hard to bless us with magnificent recipes. You are fantastic. These sound amazing but I have a nut allergy. Do you think I could sub another type of flour for the almond flour? Would whole wheat work? I haven’t tested with WW, but I bet it would work! I would love to pin your recipes but sometimes I can’t find a pin. Hmm i’m not sure why that would be happening! 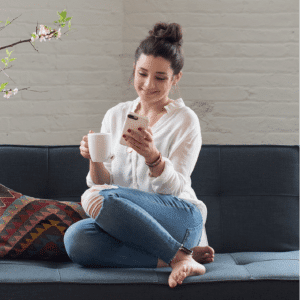 Maybe you need to add the pin it button to your browser? There’s also a pin hover on all the images as well as a pin button at the bottom of the screen if you’re on mobile! Can I used old-fashioned rolled oats instead of quick cooking oats? Do you think these would freeze well? I have some apples to use up, but no occasion for a dessert, and I don’t eat sweets very often, so would love to freeze for later use! I haven’t tested it, but if freezing apple pie works, I think it would! Don’t have quinoa flour. 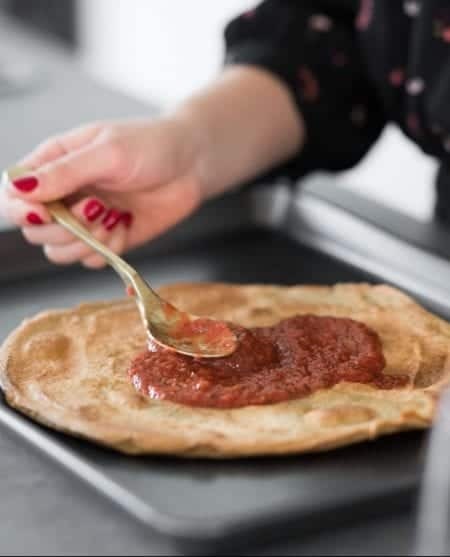 Can I use AP or pastry flour? 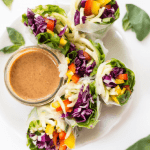 Hi, this sounds so yummy!…quick question…could I swap an egg for the flax egg?